If you can live without interchangable lenses, the Sony PXW-Z150 may be ideal for documentaries or anything requiring long record times and a zoom lens. This prosumer/pro camera has a Sony 1 Inch Exmor RS CMOS sensor, shoots UHD 3840 x 2160p at 100Mbps up to 30fps. Has built in ND filters and XLR connectors. Here’s the Sony pitch video. With the 1 inch sensor you can easily get a shallow depth of field. The Sony G lens is 2x optical zoom lens from 9.3 to 111.6mm! This is the 35mm equivalent focal length of 29mm to 348mm. The variable aperture is f/2.8 to f/4.5. The integrated zoom lens has individual lens rings for focus, iris, and zoom. The rings have a mechanical feel, even though they are not mechanical. But they are endlessly rotating. The lens produces smooth, round out-of-focus highlights. It can be used in either full-auto mode with servo control, or as a completely manually operated lens. 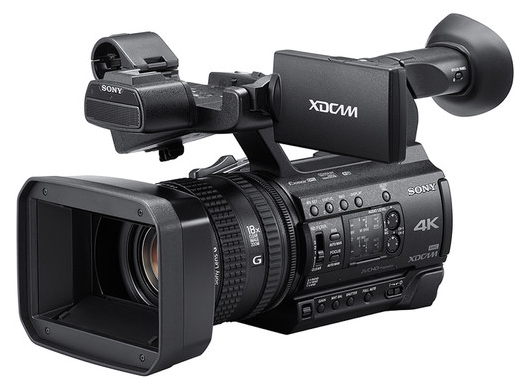 The lens on the camcorder makes the Sony PXW-Z150 a good value at about $3200. There is both a viewfinder and LCD monitor. The OLED viewfinder is 0.39″-type / 1.0 cm (approx. 1.44 M dots). The LCD Monitor is 3.5″ / 8.8 cm (approx. 1.56 M dots). The OLED viewfinder has a fantastic picture. OLEDs have shorter lifespans than LCD screens so Sony designed proximity sensors into the camera that turns the OLED off when it knows you are not looking through it. When this happens the picture appears on the flip-out LCD screen instead. But the sensor can be fooled by a hand or arm being too close to the viewfinder. You can turn this automatic switching off. Some people returned their cameras mistakenly thinking it was broken when the viewfinder turned off. It’s part of the design as mentioned above. The Sony PXW-Z150 can livestream with built-in WiFi which does not require any additional accessories. It has a remote control app so it works well as an unmanned camera. The camcorder can store 6 picture profiles which can be shared with others. 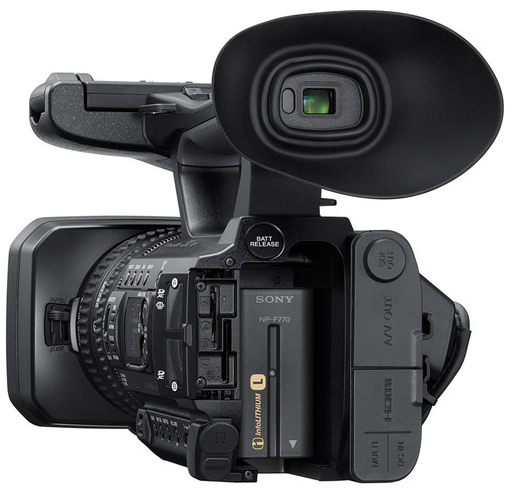 The camera also features Sony’s Slow and Quick Motion for shooting HD video at variable frame rates up to 120 fps. It records to two SD memory card slots. You can record simultaneously to both cards or use the relay mode which switches recording automatically to the second card when the first memory card is full. The Sony PXW-Z150 includes Night Shot capability for shooting in extremely dim lighting conditions. For legal depositions it has a date/time stamp as well as timecode. 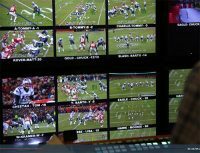 You can choose a variety of codecs: XAVC Long GOP (4K/1080p), MPEG HD at 4:2:2 or 4:2:0, or AVCHD 2.0 at a variety of data rates. There is no shot gun mic, but you can mount your own shotgun. Expected availability is Sept, 2016. I am not sure I understand what you are saying is limited…but yes, you can record using a single XLR Mic to one or to both channels. The setting is in the Menu settings. See page 46 of the manual. You can also use a stereo XLR shotgun mic which has two XLR Plugs, such as the Sony ECMMS2, which provides a wider pattern. Also, a separate battery charger is indeed included–but it shares the same power cord as the AC adapter for the camera.